A Thailand tour holiday is a great way to explore this vibrant country. Street food is everything here, be brave and eat like the locals. Relax on stunning white-sand beaches, trek in the jungle or take a tuk tuk in the bustling metropolis of Bangkok. 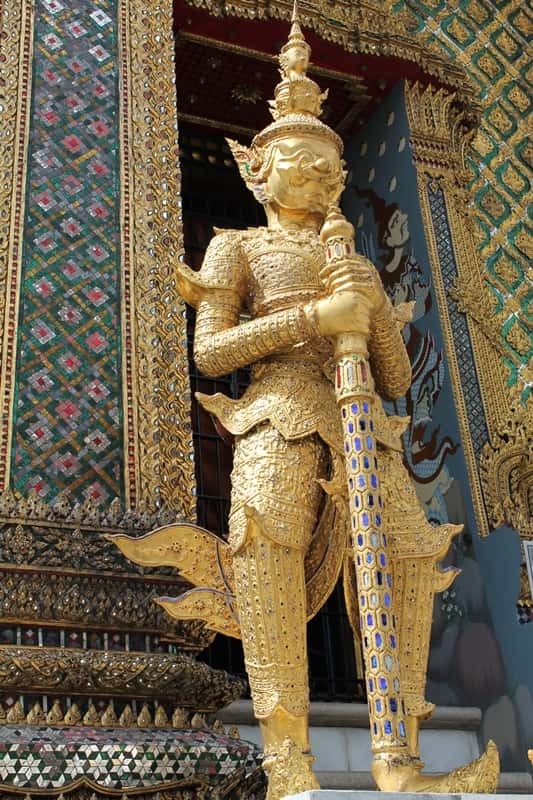 Most adventure holidays to Thailand start in the teeming capital of Bangkok. This Asian mega-city is the ultimate symbol of Thailand, it embraces everything 21st century, whilst interspersed between the modern buildings and excellent metro system are centuries-old temples and monks shopping in street markets. Bangkok captures the coming together of different worlds; the old and the modern, religion and cutting edge technology, international cuisine and local street-food. Just several hours north but seemingly a million miles away from the bright lights of Bangkok, Northern Thailand offers a retreat from the heat, hustle and bustle of the Thai capital. Chiang Mai is the North’s cultural centre, and from here there are countless options to explore the surrounding countryside. On an Explore holiday, jungle trekking to visit the hill tribes of Northern Thailand is a popular option, as is Bamboo rafting and a tour to the infamous ‘GoldenTriangle’– a notorious drug smuggling route where the Thai, Laos and Burmese borders meet. Broadly speaking the beaches of Thailand are split into two areas – to the west you have the Andaman Sea beaches of Phuket, Koh Phi Phi and Krabi, that are best visited in winter time, and to the east there are the islands of Koh Samui and Koh Phangan, where the shelter of the Gulf of Thailand means they can be visited during the summer months. No matter which side you choose, all tours to Southern Thailand encompass perfect stretches of white sand beaches and turquoise ocean. Khao Sok National Park is close to the resort of Krabi, and in the one of the oldest rainforests in the world there are options for wildlife spotting, kayaking the peaceful lakes and waterways, or staying in a treetop lodge. Thailand is a wonderful destination in its own right, but what really brings it to life is to showcase it in combination with its neighbours. Thailand, Burma, Laos and Cambodia may look very close on a map, but geography is where most of the similarities end. One of the fascinating things about trips to South East Asia is just how different each country is, from language and food, to customs and branches of religion. An Explore multi-country tour in South East Asia offers the opportunity to explore all of this and more. Thailand and Cambodia are poles apart – Thailand is rich, prosperous and modern, whereas Cambodia is a poor country that is still slowly recovering from its haunting and horrific past, scarred by the Khmer Rouge. This means travelling overland between Thailand and Cambodia offers an experience almost akin to time travel, where the modernity and infrastructure immediately drops away to cycle rickshaws and dusty roads, just a few miles over the border. The journey from Bangkok to Siem Reap’s amazing Temples of Angkor can be done in one day, and is an eye-opening experience. Probably its closest neighbour, Laos shares many similarities with Thailand, including its languages. Although not identical, there are many words that are similar, for example the Laotian greeting for 'Hello' is 'Sabaidee', and in Thai it is 'Sawasdee'. Laotions are known to be much more laid back to their Thai counterparts, and whilst Thailand embraces all things capatlism, Laos is officially still a communist country. The best way to explore both countries is on a two day Mekong river cruise, starting at the Thai border and ending in the UNESCO World Heritage Site of Luang Prabang. Thailand and Burma share the practice of Theravada Buddhism, but the differences end there. The Burmese script and language is completely different, and influences from India, Bangladesh, China and the British can be seen all around Myanmar. Tourism in Burma is in its infancy, so travelling here overland from a country where tourism is so well established offers a fascinating contrast. From the northern city of Chiang Rai, the border can be crossed to the Burmese town of Tachileik, before travelling onto the beautiful Inle Lake.